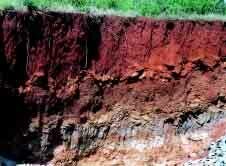 Kenyan Soils | Infonet Biovision Home. 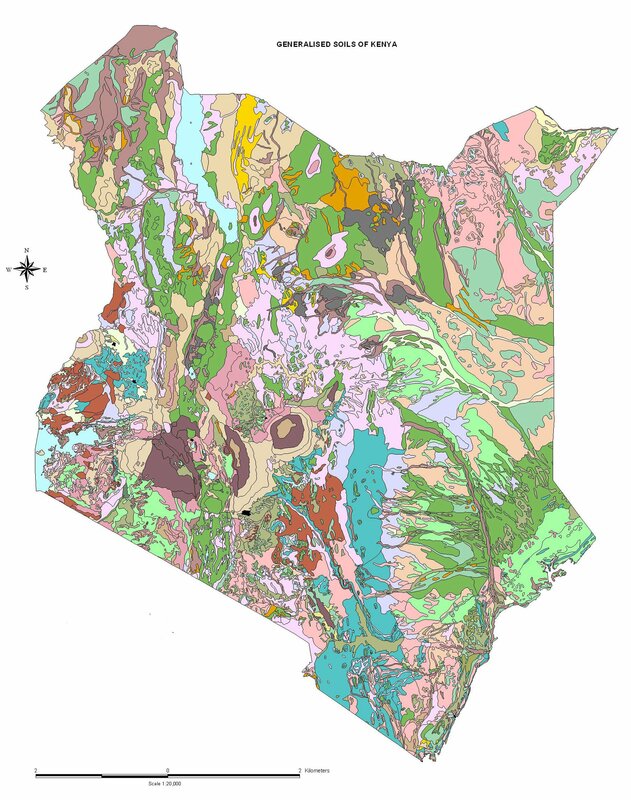 Kenya has a very wide range of soils resulted from the variation in geology (parent material), in relief and climate. Soil resources vary from sandy to clayey, shallow to very deep and low to high fertility. However, most of them have serious limitations such as salinity/ sodicity, acidity, fertility and drainage problems. The major soils used in agriculture are ferralsols, vertisols, acrisols, lixisols, luvisols and nitisols. Soils consists of solid particles, water and air and serves as a natural medium for plant growth. The solid particles are made up of mineral components such as sand, silt and clay and of organic components consisting of decomposed plant and animal residues (organic matter). Clay and organic matter have the ability of adsorb cations / nutrients, playing an crucial role to plant nutrition. Water and air occupy the pore spaces between the solid particles. Soils contain microorganisms, which decompose plant and animal residues, and microbes such as Rhizobium bacteria, which help certain plants to fix nitrogen from the air. 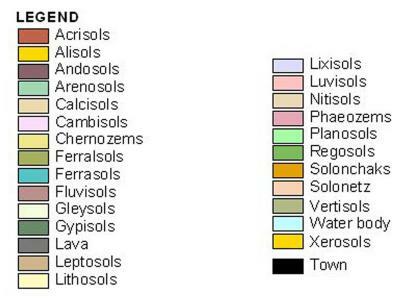 Different soils have different profiles with clear horizontal layers, also called horizons. The horizons differ from each other in their physical, chemical and biological characteristics, including colour, texture, structure, consistency, presence of organisms, degree of acidity or alkalinity (pH), etc. Soil profiles may take more than 100'000 years to develop. Primary material from which th soil is formed, for example bedrock, organic material or deposits from water, wind or volcanoes. Location on a landscape such as altitude or exposure to the sun influence the climatic impact on soils. Soils at the bottom of a hill will get more water than soils on the slopes, and soils on the slopes that directly face the sun will be drier than soils on slopes that do not. Plants and animals living in and on the soil influence soil formation. Animals, including microorganisms, affect decomposition of waste materials and the way soil particles get mixed in the soil profile. Also human impact on soil affects soil development. Time allows all of the above factors to act, over hundreds of years. Soil profiles change permanently from weakly developed to well developed over time. Andosols occur in areas with steep slopes and high-rainfall. By rainfall over 1000 mm per year, andosols are exposed to excessive leaching. Andosols are porous, have a high water-storage capacity and a low bulk density. They are also acidic (low pH) due to the high leaching of soluble bases and to the high levels of Aluminum (Al). These conditions favour P-fixation, making it no longer available to the plants. To improve agricultural production liming and the use of fertilizers is necessary. Andosols are high susceptible to erosion as they mostly occur on steep slopes. In these areas, they are mainly used for tea, pyrethrum, temperate crops and dairy farming. Nitisols occur in highlands and on volcanic steep slopes, for example in the central highlands of Kenya, some areas of the Ethiopian highlands and around Mts. Kenya and Kilimanjaro. They are developed from volcanic rocks and have better chemical and physical properties than other tropical soils: they have a good moisture-storage capacity and aeration; the organic matter content content, the cation exchange capacity and the percentage base saturation range from low to high. Most nitisols are acidic (pH < 5.5) due to the leaching of soluble bases. Nitisols have often a high clay content (more than 35%). They are the best agricultural soils found in the region. They are intensely used for plantation crops and food production (e.g. banana, tea and coffee). For optimal agricultural production, nitosols need the use of manure and inorganic fertilizers. To protect these soils from erosion, soil conservations measures are essential. These kind of soils occur in the coffee zones in the sub-humid areas, on undulationg to hilly topography. They show an increase of clay content in the sub-soil (B-Horizon). The sub-soil is often not very porous, impeding root spreading. They have a relatively low water-storage capacity, compared with nitisols. Acrisols and Alisols in wet areas have a low pH (acid), Al and Mn toxicities and low levels of nutrients and nutrient reserves. These soils have poor structure and need erosion-control measures. Organic and inorganic fertilizers are needed to improve crop production. The soils respond well to fertilizers (especially N, P and K) and to the use of soil organic matter. Ferralsols occur on gently undulating to undulating topography. They are very old, highly weathered and leached soils, and therefore with a poor fertility, which is restricted to the top soil, as the subsoil has a low cation exchange capacity. Phosphorous (P) and Nitrogen (N) are always deficient. Ferralsols are rich in Aluminium (Al) and Iron (Fe). The nutrient reserves are easily disturbed by agricultural practices.Important management practices include the use of fertilizers (e.g. rock phosphate) and the maintainance of soil organic matter by using green manures, farmyard manures and mulching. Ferralsols have also good physical properties including an excellent capacity to hold moisture. Ferralsols are used to grow several annual and perennial crops, being particularly suited to tree crops such as oil palm, rubber and coffee. Planosols and Vertisols occur on very gently undulating to flat topography, mostly in rice growing areas e.g. Mwea in Krinyaga District and Kano plains in Nyanza Province. They are found in semi-arid and sub-humid environments. Due to the high clay content in the subsoil (higher than in the top-soil), is this layer in the B-horizon impermeable resulting in a very slow vertical and horizontal poor drainage and also in an extremely poor workability of the soils. These soils are dark coloured and strongly cracking.